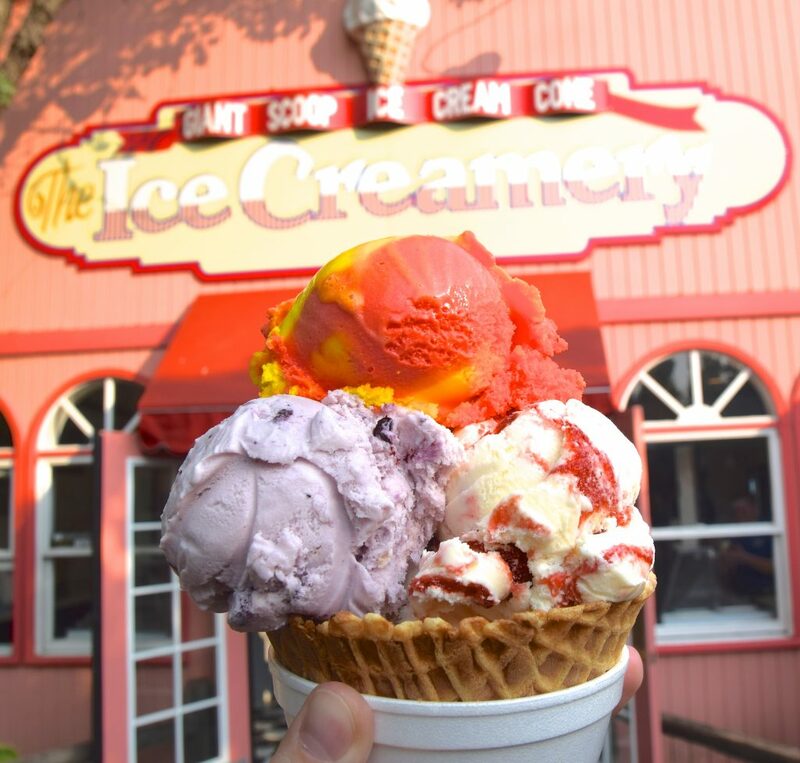 Time for more SoCal shoutouts? 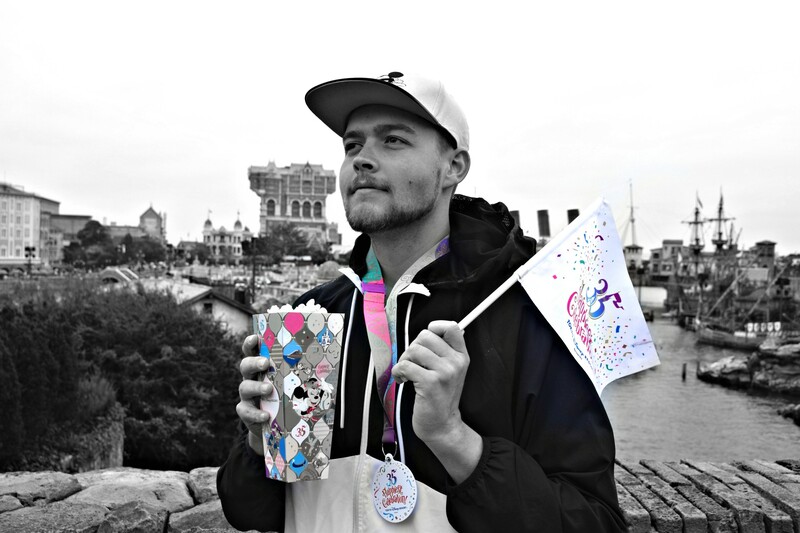 Disneyland is next. 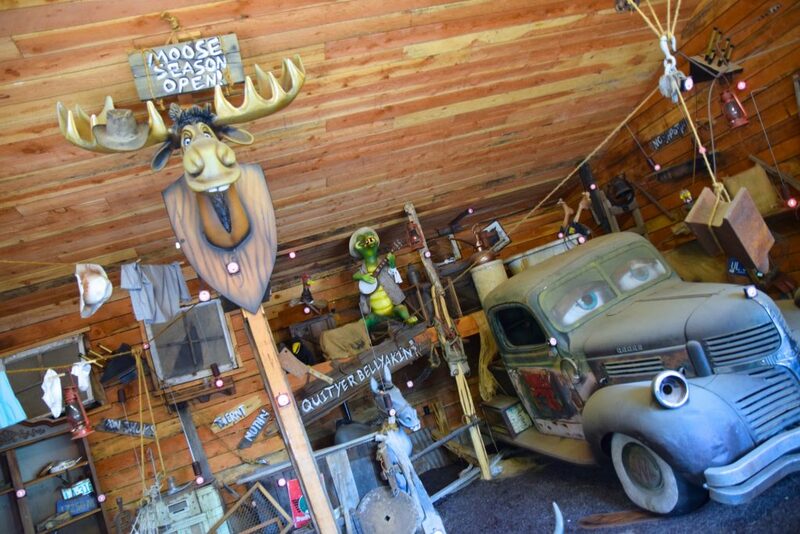 Silverwood’s shooting gallery features a bunch of Disneyland references. 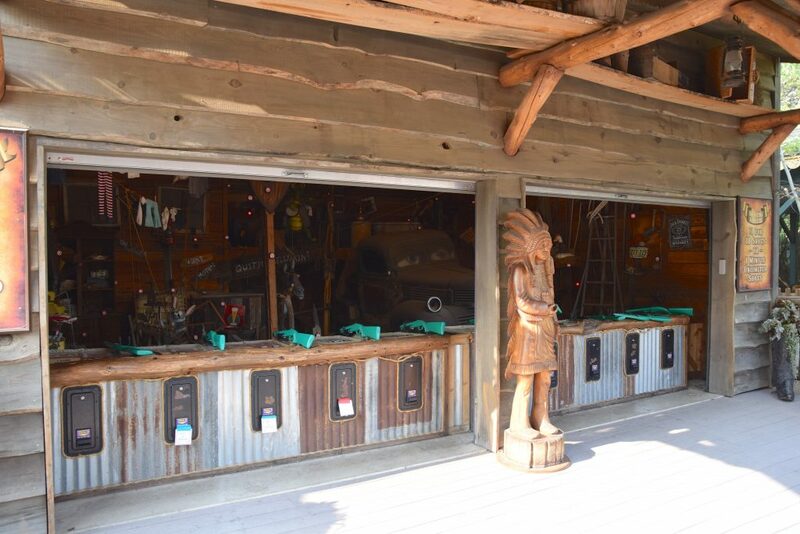 From Country Bear Jamboree to Splash Mountain to Radiator Springs Racers, several animatronics can be found inside that just scream Disneyland Resort. 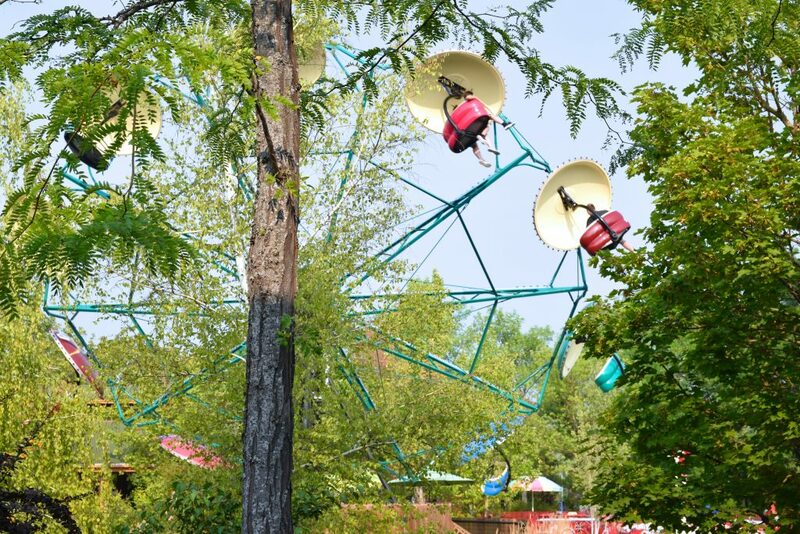 The park’s kiddie area has a very nice selection of attractions including a Paratrooper over bumper boats. 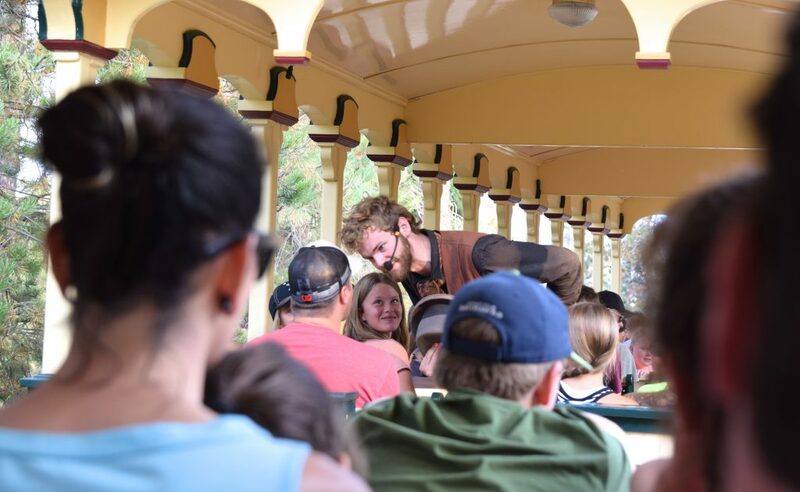 Just like any other park located in the hills and surrounded by nature, Silverwood has a train ride. A particularly large one actually! 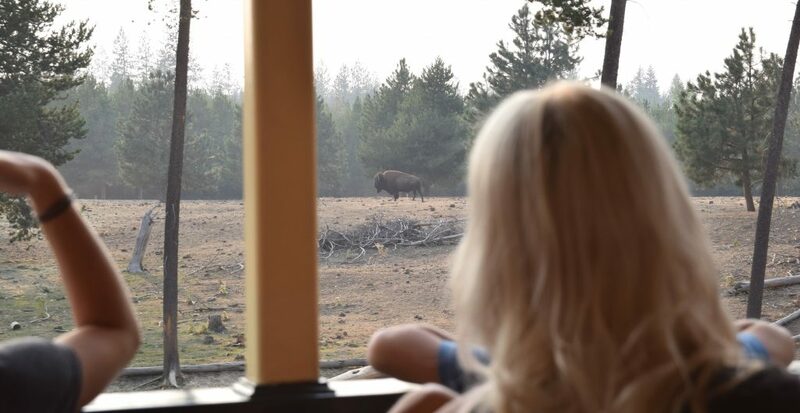 One of the many sights are bisons! We mostly came to enjoy the scenery on the train, but there is an intense story taking place with live actors onboard the train. 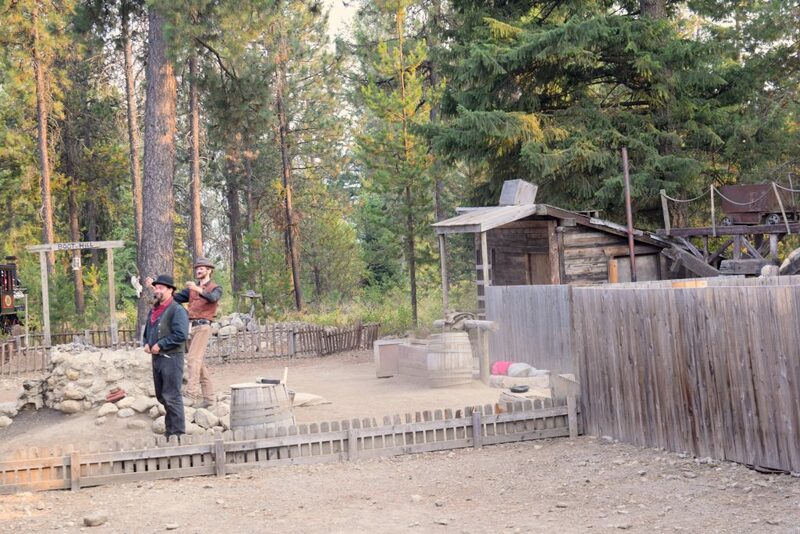 That includes a mid-ride stunt show with a train robbery for charity. It was a cute set up. Really though I wish the story was kept to a minimum so people also get to enjoy the scenery and quietness. There was just a lot going on. 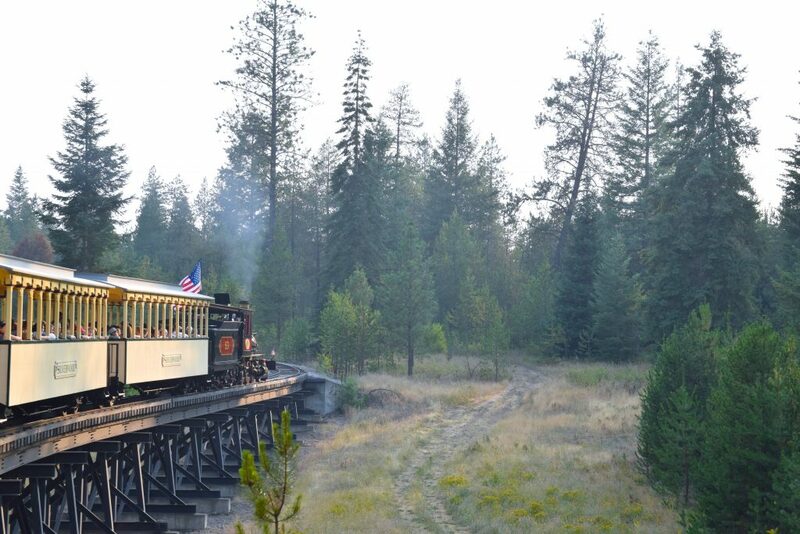 Nonetheless, the train ride is a true Silverwood classic and must be experienced when visiting the Idaho theme park. Oh hey, we get a great look of Aftershock‘s front side from the train. The impressive and very odd “Butterfly” element. 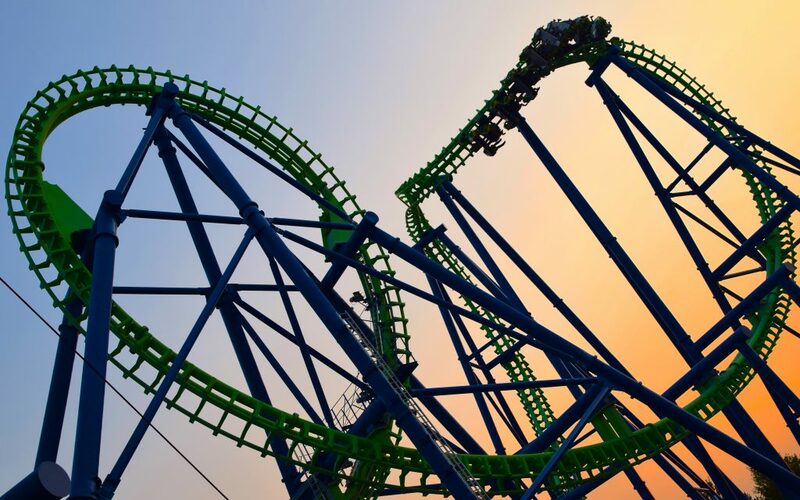 Which really is just an oddly shaped Cobra Roll with a directional change that allow for the compact layout of the ride. 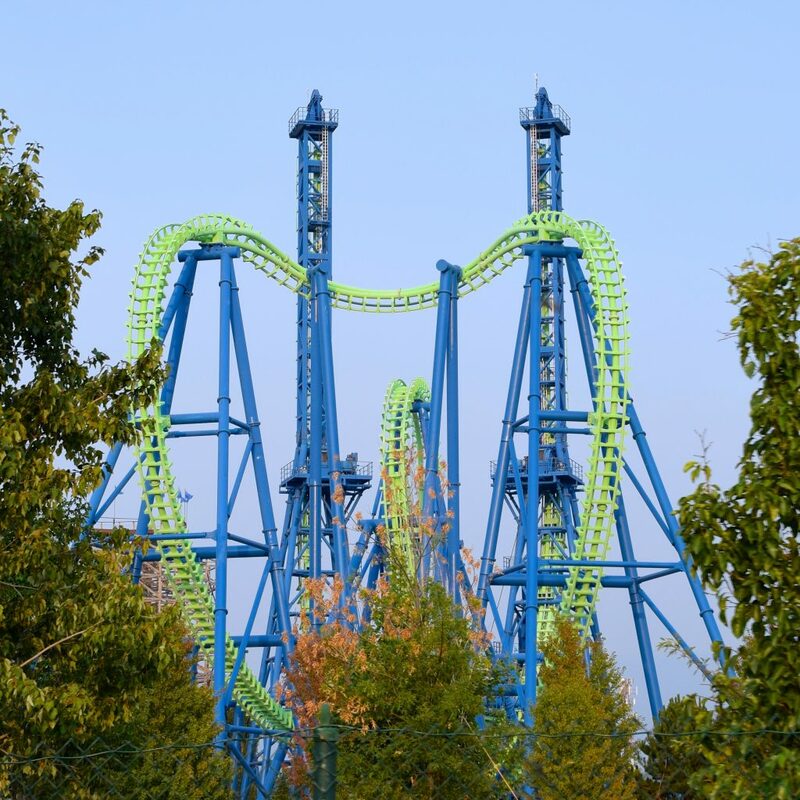 Aftershock still operates with the original Vekoma Giant Inverted Boomerang trains that have a particularly odd seating configuration. Riders are seated in a V position, and the cars are quite close to one another. 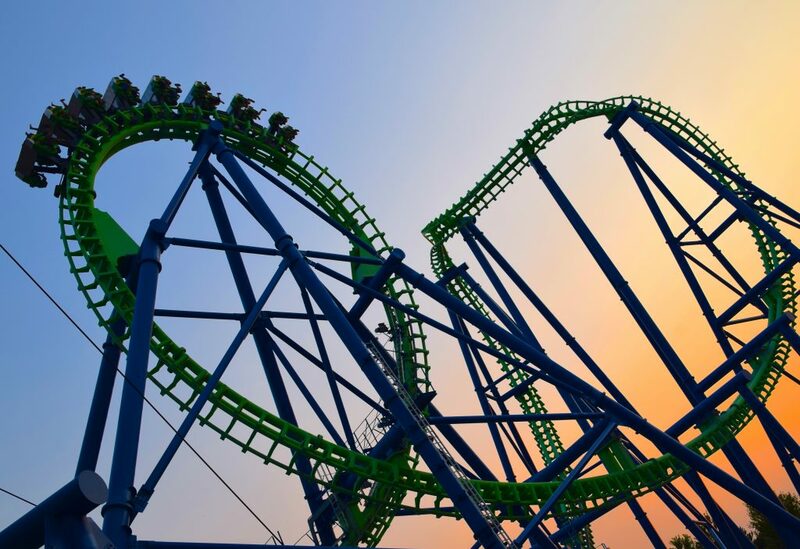 Which is likely the reason for Six Flags’ purchase of new Premier Rides trains for Goliath at Six Flags New England. Too bad the Premier trains run horribly. 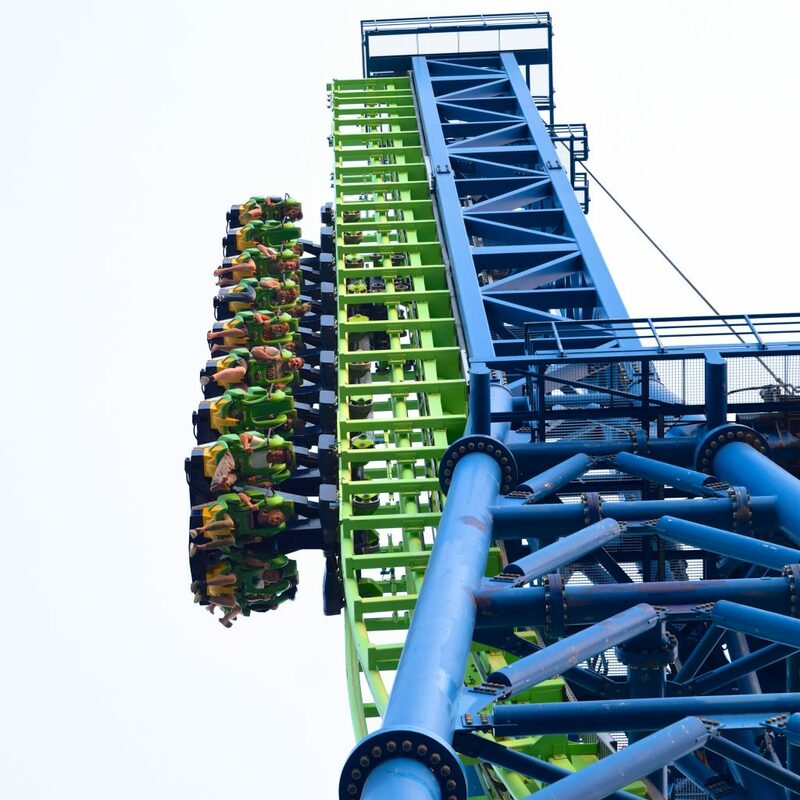 It’s hard choosing a favorite moment on the ride for me, but on Giant Inverted Boomerangs that’s always been the drop on the second tower in the front row. There’s just something about dropping 200 feet backwards. 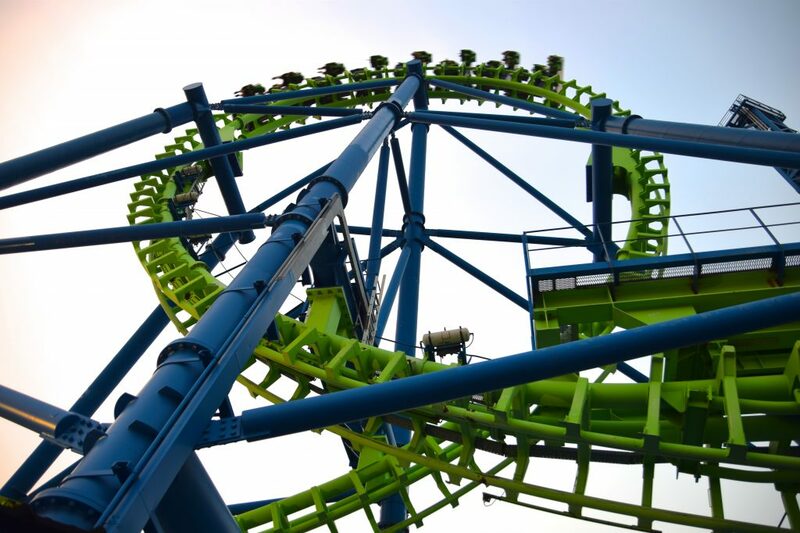 The ride’s smoothest element is the Vertical Loop. Depending on where you’re seated in the train you either rush through it or you get a nice pop of air, any seat offers a great experience though. The loop is massive. The Butterfly was a tiny bit shakier, but that’s because it’s snappy and very tight. The curvature on that is different enough to feel like a completely different element than a usual Cobra Roll. We spent a ton of time riding and taking pictures of Aftershock, but in moderation. I had forgotten how intense these rides were. They are not very reridable, and that’s not because they are not smooth, they are just very intense. Timber Terror just next door was the park’s original wooden coaster that opened in 1996 as Grizzly. Paramount used that name for their wooden coasters at that time and caught wind of Silverwood naming their CCI woodie Grizzly, and promptly forced the Idaho theme park to choose a new name. That’s how Timber Terror became Timber Terror. The ride itself is quite smooth, features a few pops up surprisingly good airtime, but overall just didn’t impress me too much. The layout is a rather simplistic out and back, and the coaster is short. Though fun and worth the wait, it didn’t warrant for a reride. The park only has one train for each of their coasters, and that created particularly long lines for their wooden coasters. I hope some day they manage to add transfer tracks and additional trains. Can you guess what we made sure to get nighttime rides on? 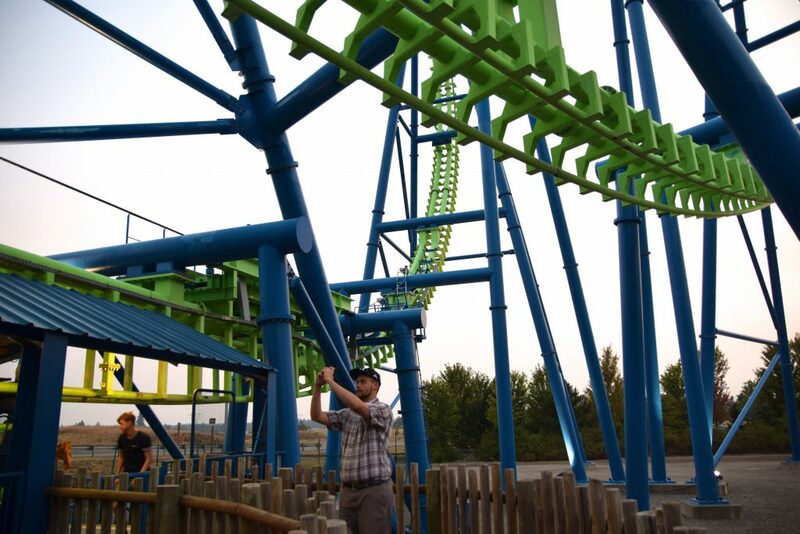 If you guessed Tremors or Aftershock you were right! 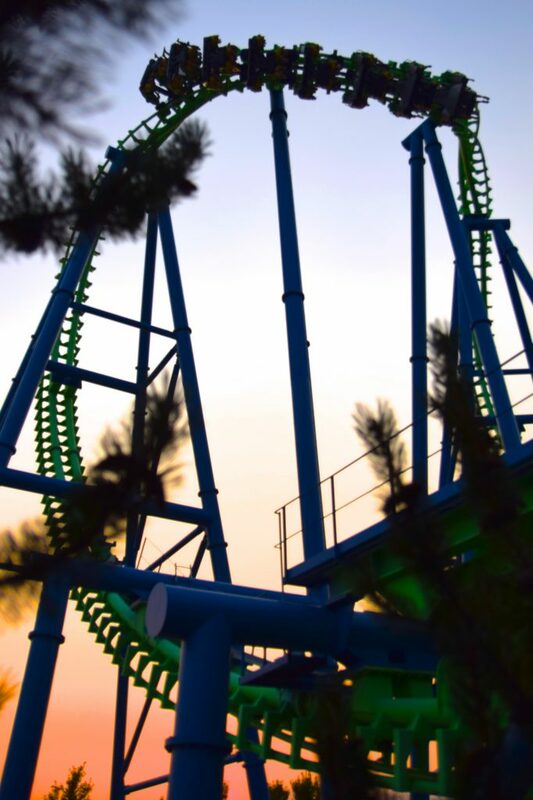 Tremors ran much better at night and really turned into an airtime beast. Aftershock is what I expected, even more terrifying when its dark out. Absolutely amazing. After riding Aftershock, which had been a priority all day, we had approximately 5 minutes left ’til park closing. We had yet to catch our last credit of the day and thus we sprinted over to Krazy Koaster, the park’s 2014 SBF Visa Spinning Coaster. 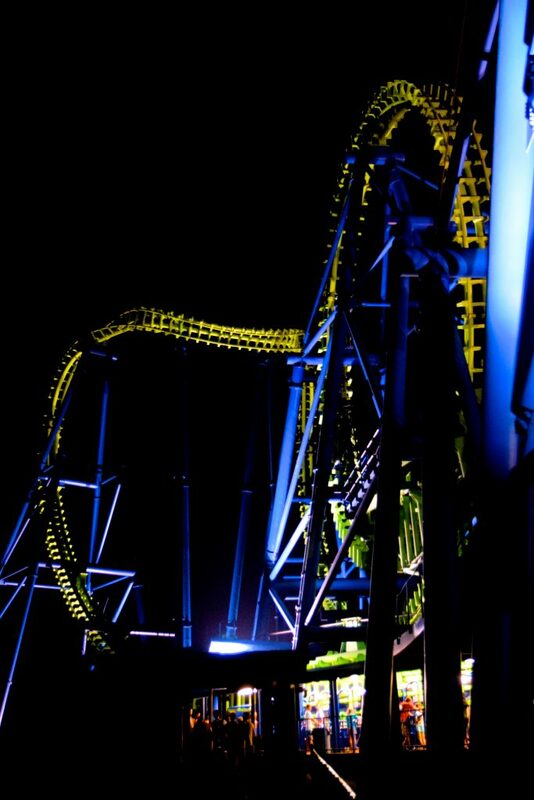 Silverwood has a lot going for it, even at night it’s such an aesthetically pleasing place to be! 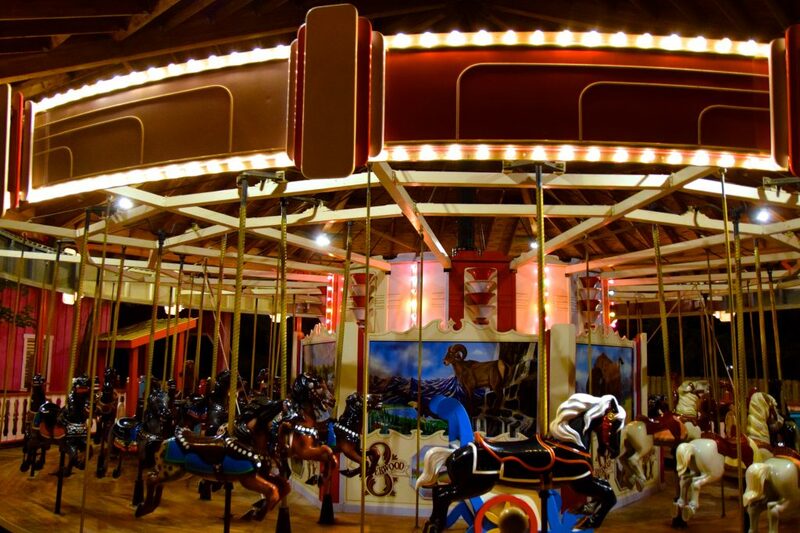 The park is filled with classic rides, all maintained as if they were just built. It begs the question, how can an independent park look so perfect and beautiful but a chain theme park can not? We’re going to finish this report with a few more Aftershock pictures. Notice the lack of an evacuation platform on the Butterfly. This installment was relocated without the platform and it has not been an issue. It sure looks cleaner. Aftershock is the main reason for our visit. The park has some great classics and an impressive polished look. Having said that, Silverwood is a good theme park without this giant beast of a coaster. 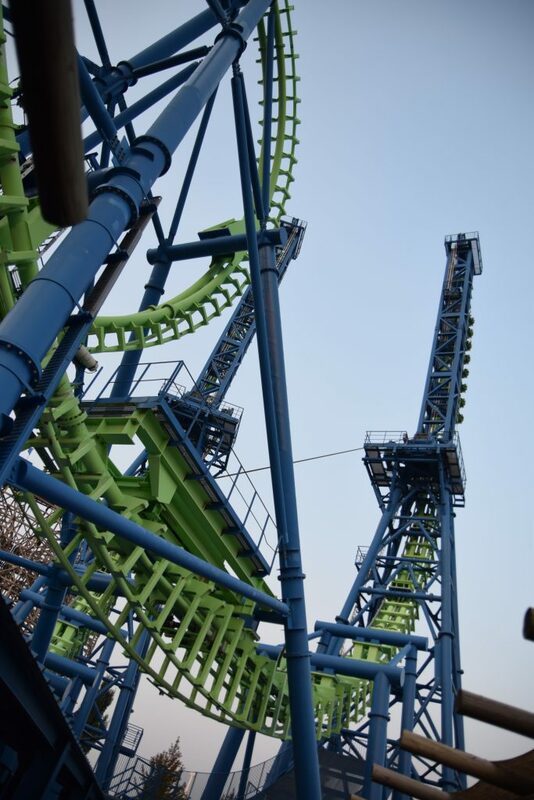 But the fact that they are able to maintain and operate this Vekoma Giant Inverted Boomerang so consistently is what makes them a great theme park. They are dedicated to their attractions and its blatantly noticeable. In fact Vekoma has come to Silverwood to learn about the changes made to the ride and how to improve their other installments. If that doesn’t show Silverwood’s dedication and love for its attractions, than I do not know what does. 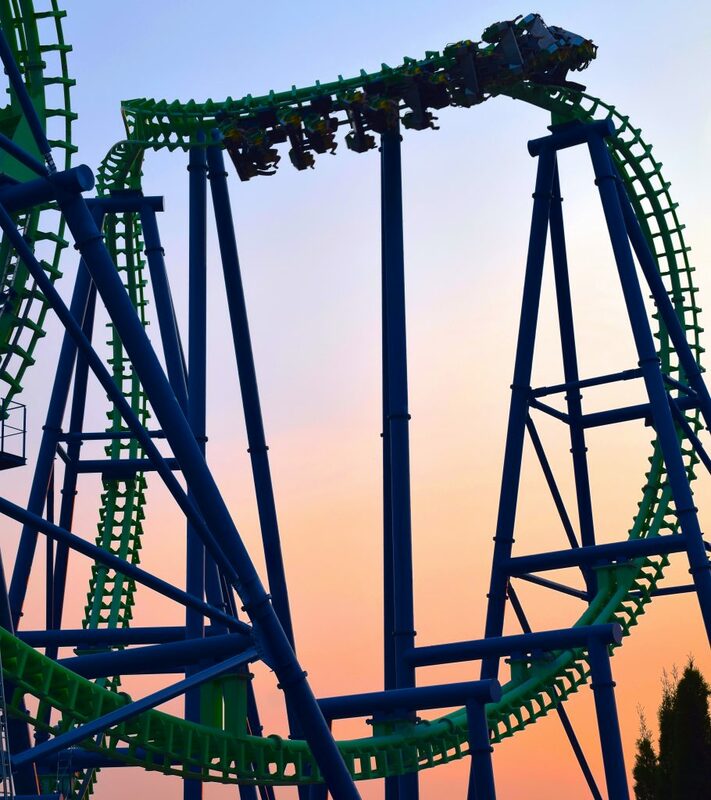 During our trip several people asked me if it was really worth a trip all the way to Idaho to visit Silverwood. There are definitely times where I would not make a trip to a park again because I don’t think it was worth it. 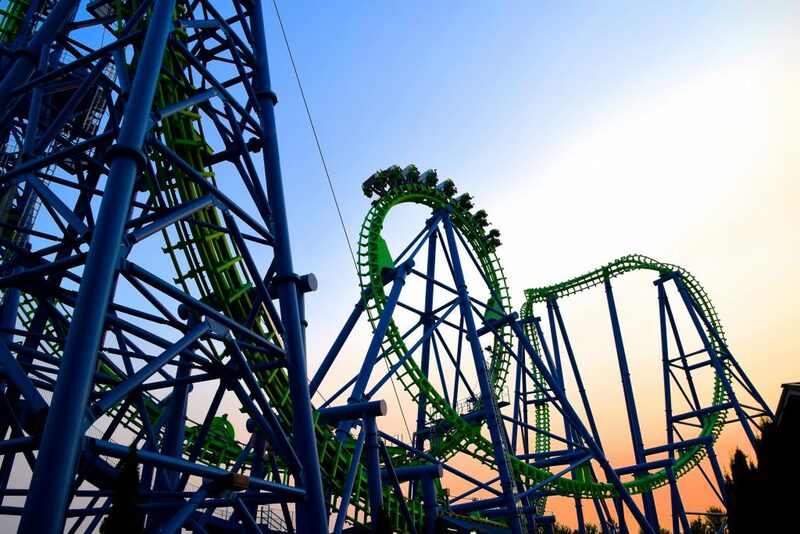 Silverwood on the other hand is a must-experience park in the United States theme-park industry, I would make the trek back to Idaho in a heart beat. Thank you Silverwood for the wonderful time. We’ll be back. And for those missing Deja Vu, this is the place to visit. 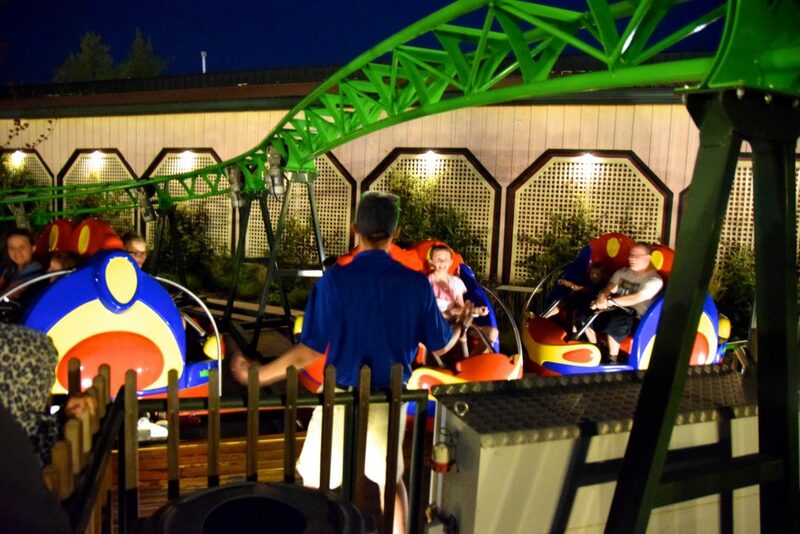 Thank you for checking out this Silverwood report! We’re on our way with more content from Europe, Florida, and California of course.